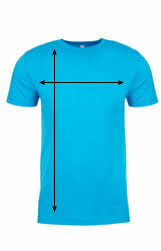 The Next Level t-shirt is a popular, retail-fitting tee. Made using 100% combed ringspun cotton, the 4.3 oz Next Level is a solid choice for t-shirts. Pre-laundered to reduce shrinkage.